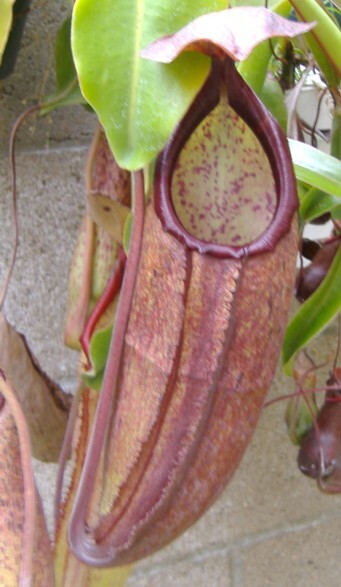 Nepenthes species #1 originated from Borneo Exotics. I don't know the rules for numbering unnamed species so sometimes it gets confusing describing exactly which unnamed species one has. This plant like the species #2 from Borneo Exotics was very inexpensive. I grow it as a highlander outdoors year around in full sun. It has been a steady grower but still isn't in the vining stage quite yet. As far as I know this Nepenthes hasn't been designated with an official name yet but that could change. For me, this plant has performed much better than the sp. #2 from Borneo Exotics. It's not a showy plant compared to other Nepenthes so it doesn't get much attention. I've never had any problems with this particular plant and seems to be pretty hardy. 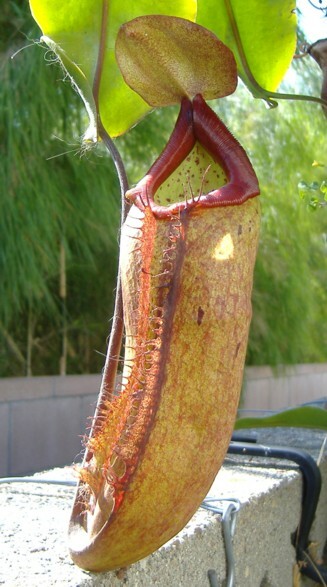 Also I haven't seen much information or photos in the Nepenthes forums about this unnamed species either. Maybe this plant will turn out to be a natural hybrid in the end but there's been no hint of that from Borneo Exotics. They list their available plants from 24 different clones in tissue culture so there may be some differences between the clones especially for males and females.